Are you working with multiple devices like iPhone, Android and Web, then take a look at this post that explains you how to develop a RESTful API in Java. Representational state transfer (REST) is a software system for distributing the data to different kind of applications. The web service system produce status code response in JSON or XML format. Sample database website table contains four columns id, title, description and url. Create a dao(Data Access Object) method GetFeeds with Arraylist datatype, using select statement getting results from website table. Binding results into feedData object. Next post I will explain RESTful web services with inputs and JSON data transformation. Hi man, Thanks for all your postings... Please post how to create a toolbar for all web browsers. What minimum version of JEE is required and it works with any application server? Tomcat? Please post on how to create the same with php. and how to communicate via soap messages. You may want to close you connection :). Perhaps too many concepts at once, and too much detail. I think DTO stands for data transfer object... Am I wrong??? Very good work, thank you very much ! Could you please also make one based on PHP? In response to my previous message for a version on PHP : you already did it ! What's up with the WCF web service in .Net. Have tried everything to get rid of the 400 Bad request error on the server side when uploading an image. It seems like everyone else out there is having the same problem. I have not seen a complete project yet on it. 1.In Rest full services who will convert object to json,object o html,object to text where as in jaxws jaxb binding will take care of this. 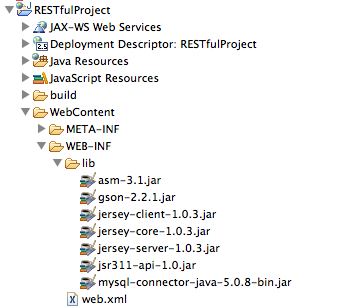 In rest converting obj to xml jaxb only what abt others like html,json,text. 2.Directly the JSON data is transffered from the consumer to provider or any thing bindings happed in the middle. Please help on these questions. "DataBase" class is not available and thus showing error to me?? Is it built in?? I think DataBase class is in the dao package that is not available in the example program. Please check it. Great work, I really apreceate it. Error :"INFO: Servlet ServletAdaptor is currently unavailable"
can u plz tell me how to help me by showing me servlet code snap. Plz Plz i need to learn a how ESTFul webservice is created. Because I have to use webservice for my Android App. I am Anush. I am using rest services in my application. I am using services which are giving xml format output. But i am unable to read the parameters from outside. Means from a jsp. Can u tell me how to read parameters from jsp and how to send if any types avialiable. Can anybody knows about how to post the form date through the java web service. For those trying to figure out where doa.Database is, it's in the downloadable Project Source files at the top of the page. Just extract that file to your dao package and you're good to go. HI thanks for the post can you please provide the dao.database file also ??? Thank your for sharing your knowledge. 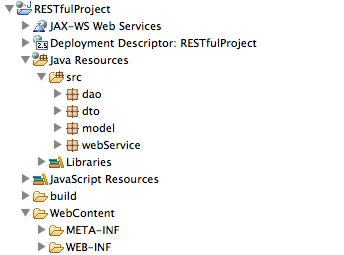 Hi, I have a JAX-RS Restful webservice. This resource/webservice is asset for us. I am exposing this service url to third party client that would call this service resource. I want to protect this service from another authorised client/vendors. I thought to include an API key and the API key should be matched with a perticuler client API Key. And I also need to match the client url address means from whcih url the request is coming. How to do this. How to get the URL that is calling the our rest service. I am deploying my rest in Tomcat 7.0. When I try to use POST method instead GET method, i always get "HTTP Status 405 - Method Not Allowed". Can anybody hel me? Hi friend i am creating webservice by refering your above code i want to access that service through my Android Application . Can you please tell me what is that Database class? Is this project using Maven or Ant ? This tutorial is helped me a lot...i want to read these table results from my ios app,,,,is that possible one? Thanks Srinivas . it worked for me. how can i connect Mysql database using angularJs via java code??? sir please send program for insert query for this table..
Sir Please give me a web service for login after successfull connection with ms sql db. Please help me it is my first tast in my new job. can you please post for angularjs with mysql. fetching data from mysql and use front end as angularjs. Here is Database class that is 'not' missing in the downloadable project. Great it works!! !, However I think you need to generate your own web.xml, by creating a dynamic web project in eclipse. hi bro very much helped thank you so much..
Hello, where is the MySQL data connectivity with URL, USERNAME, PASSWORD? This is harini can u plz tell me how to get json without using gson with list of object from database. I wanted to create simple web site using java which is facebook like.User can create posts in their wall . He/she invites other users to like his/her post comment give stars . All this information along with comment,starts will be stored in mysql database. after some time user can review his/her post how many stars likes he got. First design your database tables, create RESTful apis for update statements. post annotation is not working, it shows a blank page and not able to insert values into database, can u please show crud operations using the same example. After upgrade to java 8 and Tomcat 8, It is throwing error like 'TypeNotPresentException'. Please help me to resolve this. Thanks.